The word ‘burlesque’ itself may draw vivid images to mind; humor, laughter, fantasy, excitement, theater, dance, costumes, expression. If you combine those images with vibrant New York City nightlife you reach a thrilling experience. The reason so many of us are drawn to the emotional performance, known as burlesque, is this combination of images and sense of emotions. Contrary to some people’s beliefs about burlesque you can discover some of the most intellectually and artistically arresting experiences at these arousing (in more than one way) burlesque shows. Burlesque may be compared or even mistaken for exotic dancing, but after being exposed to it you will see it as its’ own unique form of artistic performance. The lifestyle of these performers will have you transfixed if the performance itself doesn’t first. It is like stepping into a different world. It isn’t just the beautiful women, it is the entire atmosphere that creates its’ uniqueness. These brilliant individuals can turn a damp basement of a theater into an urban castle. The costumes and performances are unbelievably creative. It is guaranteed that you will be roaring with laughter and maybe even shedding a tear with the witty banter, sexuality, and unique literary focus included in each show. The artists involved are well-rounded individuals from all walks of life. Outside of performing, the job titles of the artists vary from student to secretaries, to actresses and teachers. This diverse group helps to create the perfect, unique show each time. Not only are the women performing, but they are also filling the roles of director, manager, costume designer, promoter, book agent, and the list goes on. The time to make the costumes, write the script, rehearse, decide on musical pieces, practice, and perform adds up to an astounding amount of time and energy. By stepping into the shoes of someone leading this performance lifestyle, you can get a sense for this on-the-go state of mind. Even the glittery, feathery homes of these artists show hints of their unique lifestyle. The physicality of these performers is amazing. They maintain ballerina-like grace in extreme positions, twisting and bending their bodies in ways that would make a pretzel envious. While many people may come to watch the dancing, it’s the story that each performer has that takes precedence. There is also the narrative and artistic quality of each show is what makes burlesque so interesting. The shows can vary from performers starting in only underwear and putting their clothes back on, while listening to classical music backwards or a performer wearing huge white wings claiming to be the Mother of Jesus, while dancing to Madonna’s Like A Virgin. The performers and writers involved create a unique story for each performance; you will never see two of the same. Women are not the only performers; men also participate in the burlesque action. While there are fewer in number, the performances the men create are just as elaborate and witty as their female counterparts. At this point, you’re probably wondering, “Where can I find these thrilling performances you speak of?” The Delancey, The Slipper Room and The Box are some of our favorite spots to witness this unique artistry in action. The audience can even go onstage between sets at The Delancey and live out their burlesque dreams. You will find that the people in the crowd are just as diverse as the performers. From the Wall Street broker spilling his dirty martini to the rocker who is high-fiving the bride-to-be celebrating the night for her bachelorette party. Regardless of their differences, in the end everyone seems to have a good time. The environment is very open and welcoming, so don’t be shy to head out tonight and seek out a performance you will surely not forget. 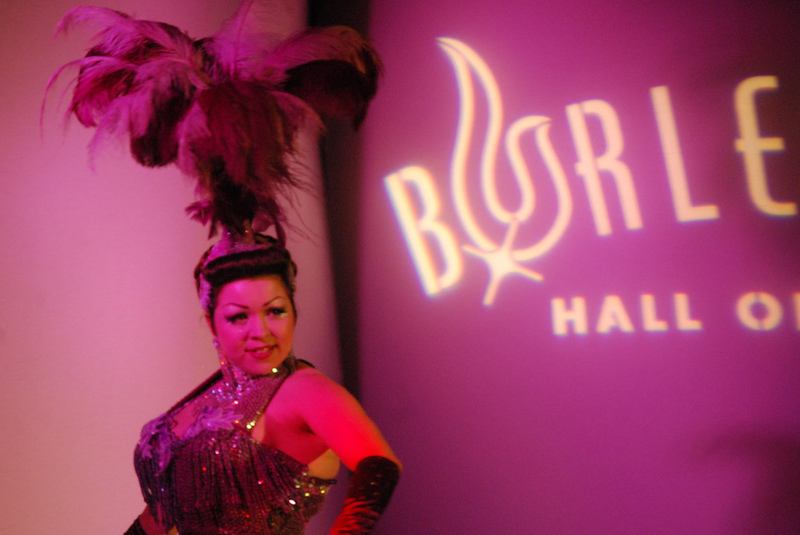 Where’s your favorite spot to see a burlesque NYC show? Please share in the comments below! Visiting NYC? Book a private photo safari for a custom itinerary and high resolution photos included in the experience!